On Saturday 27 April Motherwell took to the field at Rugby Park in front of a huge support. 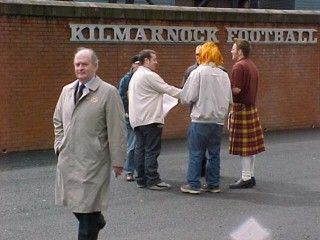 Kilmarnock had reduced prices; pleas for fans to turn up in numbers had been heeded and the 'Well Worth Saving campaign was launched. Terryy Butcher was in charge of the team and they delivered an emotional 4-1 win (report here). A fans' meeting was called on the Thursday of the following week. Such was the response that that it had to be moved from the Cooper Suite to the Cooper Stand! The hundreds in attendance agreed that a Supporters Trust should be established and a generous bucket collection was taken to help with the set up costs. 'Well Worth Saving badges and car stickers were snapped up. The Trust constitution was formally agreed at a packed meeting in the Majestic on 18 June. The WWS campaign had raised over £5,000 and donations of physio equipment and kit for the youth set up were agreed. The Trust continued to pursue its aims to promote the influence, ownership and representation of the fans to the club for the next ten years and the formation of the Well Society in 2012 can be seen as a fitting evolution.